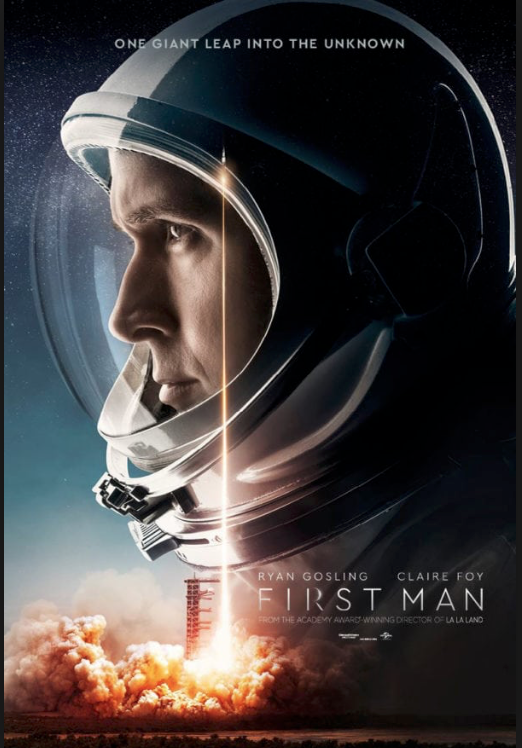 First Man by Universal Pictures is an absolutely fine peice of filmmaking. Chosen has our Critics Pick by the Broadcast Film Critics Assocation (BFCA) this Neil Armstrong biopic by La La Land Oscar-winning director Damien Chazelle takes you back in time to the moment in space history with enough realism to make you realize exactly what it was like in a way you had never thought of before and gives insight into the man who has been called one of America's greatest heroes. Ryan Gosling reteams with Chavelle with this Josh Singer written film, the awaited followup to the 6-time Oscar winning film that is based on the book by James. R. Hansen. Watch for this and A Star is Born as hands down Oscar nominees. This is filmmaking at its best and for Chavelle to be so varied from a Whiplash to a LA LA Land and now this - proves hands down - this is one of the best directors in the business today. The first-person intimate simple story focuses on Armstrongs domestic life and looks at his relatisnship with his family while it takes us to NASA's mission of the first man to land on the moon during the 1961-1969 and the sacrifies we knew little about. This was a massively dangerous mission in the 60's and the movie shows us what Armstrong went through as we delve into his core as a man and his family. Shot with an unconventional visual style, Chavelle trades in musical scenes for an opening that grabs you like few others on screen. The supurbly edited film by Tom Cross opens with a memorable heartpounding, nailbiting, deafening shaking of a scene of a test flight in 1961 that makes us feel exactly what it is like to be up there in those days prior to space shuttles. It is so real, it is nauseating. It is so well done it creates anxiety. You really feel what it was like at the time in these almost tin-can sounding shapceships that amaze us that they actually lifted off the ground, let alone stayed up. This was a test flight flying over the Mojave Desert with scenes that go back and forth from Armstrongs eye closeups to the space ship control panel board. We learn about the personal man and what he was dealing with as the story puts his life into full throttle. In those days, he had a small daughter Karen who had a tumor and died in June 1961. Karen was diagnosed with a malignant tumor of the middle part of her brain stem. X-ray treatment slowed its growth but her health deteriorated to the point where she could no longer walk or talk. She died of pneumonia, related to her weakened health, on January 28, 1962, aged two. He had an unassuming wife Janet who is played by Claire Foy so subtlely. Oscar winning performances by both her and Gosling. Foy's portrayl is so understated one has to relaize what a great peformance this is. We learn Armstrong is not a man who cries and not a man who jumps with joy; understated to say the least on the surface yet rumblings within, even keel to the point of emotionaless to the world, yet calcualting within. Ryan Gosling was the perfect person to play this part. (When you meet Gosling in person, he has much of Neil Armstrong's reserved look and demeanor.) We learn Janet is a women who is angry due to fear she and her surivivng two sons may loose their husband and father. We see that Armstrong is a man torn between his famlies needs and his work. If you can see this movie in IMAX - do so. Remember "Gravity" starring Sandra Bullock and George Clooney? Same thing. IMAX is a must to see the moon in its fully glory. The silence that Chavell allows to fill the screen, although a predicitable filmaking choice, is breathtaking (in the way that it takes your breath literally away) The movie is filled with close-ups that are never done on screen, giving you a feeling of sitting on their laps. The cinematography in this movie is awarding-winning. You feel what it's like to be up in the vastness of space and the beauty of its silence. Remember 2001: A Space Odyssey? This has that feel. The cast fills out with Armstrong's supervisor, Deke Slayton, played by Kyle Chandler who does it perfectly. (Chandler is meant for these roles) Armstrongs best friend, Ed White is played Jason Clarke. Later in life, Neil Armstrong always kept a low profile which many said made him a reculuse. He turned down most interviews and public appearances yet others say he was not a reculuse just humble. In 1993, Armstrong found out his autographs were being sold online and most of them were forgeries so he stopped autogrpahing material. He did answer all requests for congratulations. His family described him as a "reluctant American hero." John Glenn, the first American to orbit the earth, recalled his humility saying "Neil Armstrong didn't feel that he should be huckstering himself. He was a humble person that that's the way he remained after his lunar flight, as well as before. "Armstrong underwent bypass surgery in 2012 to relieve blocked artieries. Although he was reportedly recovering well, he developed complications in the hospital and died in Cincinnati, Ohio, aged 82. After his death, Armstrong was described, in a statement released by the White House as "among the greatest of American heroes—not just of his time, but of all time." he statement went on to say that Armstrong had carried the aspirations of the United States' citizens and that he had delivered "a moment of human achievement that will never be forgotten. And finally, I can't nignore that there has been loud Anti-American toned controversy about the film. One complaint? We do not see the planting of the American flag on the moon - but we do see the American flag throughout the movie. This was obviously not an overnight but a conscious effort by Chavelle. I would not have left it out myself but Chavelle chose to and this - is his artwork.